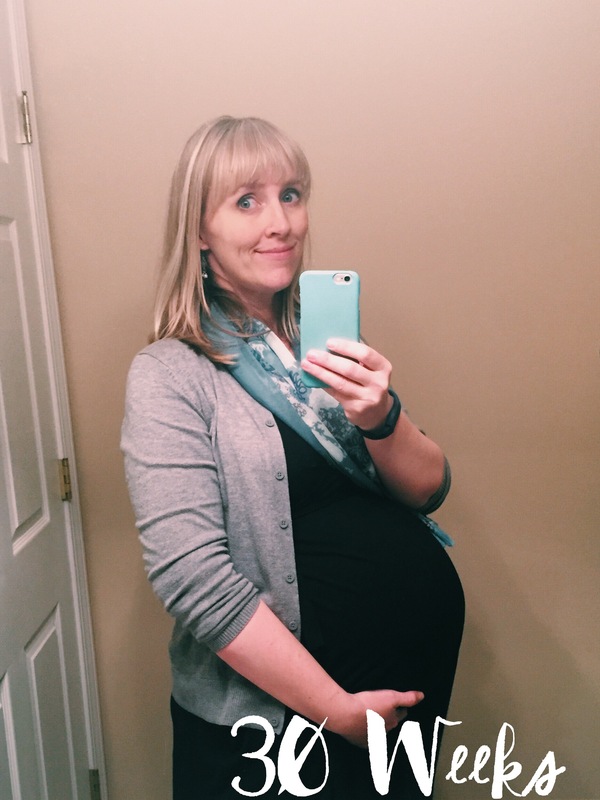 Thirty weeks, y’all! THIRTY. This feels like a big milestone for me and the babies, I have to say. For some reason, the thought that it’s “just four more weeks” until the time that the babies will be mature enough to be born & cared for at my local hospital (instead of at a regional hospital with a more advanced NICU) is very comforting. And of course there’s a maximum of “just eight more weeks” until they’ll be born! That’s not even two whole months. The Babies are the Size of: Two summer cantaloupes, according to my Ovia app. I checked the “weird-but-cute animal” option they have this week and saw that the animal is a duck-billed platypus. So far, the animal has always been something fairly creepy and rodent-like and therefore unworthy of mention, but the duck-billed platypus is a pretty darned awesome animal. So there you go. Two of them. How I’m Doing: Oh, y’all. I am large. I have gotten to the point where it is a genuinely difficult task to turn over in bed from my left side to my right side (the only two options I have) and actually getting up out of bed is honestly a workout. My core muscles: they are taxed. In other woes, I have started having tingling and numbness in my hands when I’ve been lying down, so whenever I wake up to either turn over or to go to the bathroom or to get up for the day, I have the additional hurdle of trying to make my hands work for the first few minutes. This is all I really have to complain about though. These problems are not such a big deal — they’re normal and expected discomforts of pregnancy, and much less than other women have to deal with. On the whole, I still say my pregnancy has been smooth and easy. Braxton Hicks are still my only real complaint — my body doesn’t like being vertical or moving around too much. I look forward to returning to active life in January, but for now, if you need me, check the couch. Movement: For quite a while the babies were both having a kicking party in my upper belly, both being head down, which made for some pretty impressive occasions where their movements could be seen from the outside. In the past day or two, though, I think at least one of them has changed position. Kicks today seem to be happening a lot lower down (ouch) and feel more internal rather than on the surface of my belly. I won’t find out exactly how they’ve moved until my next ultrasound, though, which is in three weeks. They could decide to change it up again before then, so this is really all just speculation. I wish they’d either both just stay head down or that Baby A would be breech, eliminating any questions about a vaginal birth vs a C-section. Names: Not long after I posted about our name uncertainty, the topic came up again and CW and I both agreed that the names we’ve been talking about just feel like the right ones. We do have the other choices as possibilities, but neither of us feels that those are our babies’ names. So it seems like we’ve unofficially officially decided. I think. Whew. Nursery & House Progress: We’ve gotten a lot done lately! All the clothes are washed and the furniture and gear assembled. The changing table is stocked up with supplies and the cribs are made. The bassinets are in our bedroom, ready for the first weeks/months. The hand-sewn birds for the mobiles are finished. All we still have left to do is install the car seats, hang the mobiles and other art, and touch up the changing table paint. I still have to wash some used cloth diapers and prep some new ones, but that doesn’t need to happen immediately (we’re starting with disposables until they’re big enough to fit the one-size cloth diapers). Phew. It’s definitely started to feel like these babies are really coming, and relatively soon at that. BUT NOT FOR ANOTHER 4-8 WEEKS, KIDDOS. Okay.